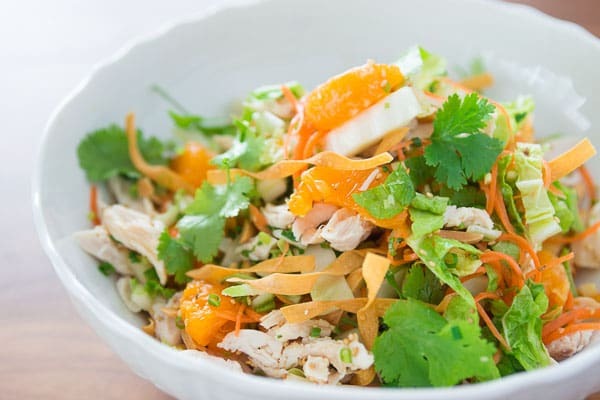 A lighter Chinese Chicken Salad, with sweet mandarins, crunchy wontons, and tender poached chicken in a sesame ginger dressing. As you may have guessed by the dubious name, Chinese Chicken salad is about as Chinese as Keanu Reeves. So where does it come from? Where else, but the capital of salads, the region that birthed the Cobb and Caesar salads as well: Southern California. Unlike most Chinese-American dishes that were adaptations of real Chinese dishes, chicken salad doesn’t have any clear roots in traditional Chinese cuisine. 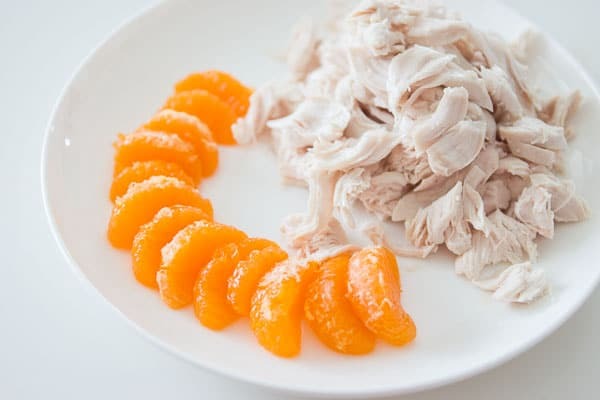 While most of what we now know as Chinese-American cuisine came about in the latter half of the 19th century as Chinese laborers attempted to recreate the tastes of their homeland using local ingredients, Chinese chicken salad is a relatively recent invention, dating back to the 1960’s. Despite its relative youth, it’s now become one of the most recognizable “Chinese” dishes, appearing on menus from the Cheesecake Factory, to Jack in the Box. While there are huge variations in toppings and dressings, most involve deep fried toppings and a dressing that’s cloyingly sweet. Cheesecake Factory’s version has 960 calories! I’m not one to make a fuss over calories, but what’s the point in eating a salad when it’s as caloric as an In-N-Out Cheeseburger + fries + Coke. That’s why I decided to do a lighter take on this new classic. 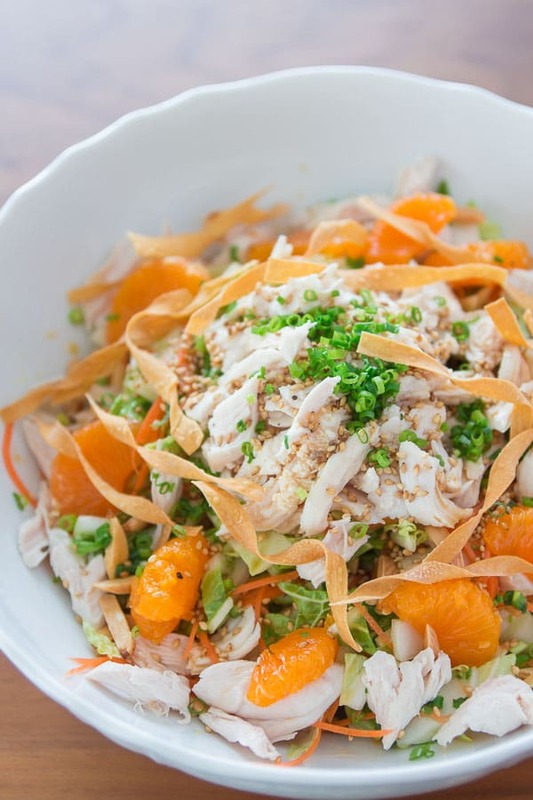 Crunchy, crispy, juicy and tender, this salad hits just about every texture you could ask for, and yet with gently poached chicken tenders, baked wontons, and a subtle sweetness derived from orange juice and fresh mandarin segments, it won’t bust your diet. The tangy dressing sings with ginger, spicy mustard and white pepper, while the nutty almonds, pungent scallions and herbal cilantro provide an abundance of variety to keep you looking forward to the next bite. 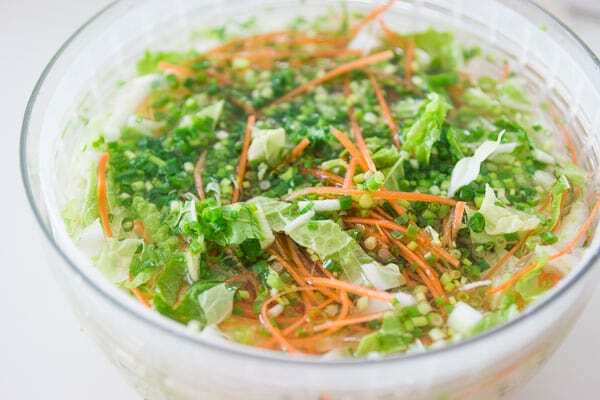 In a bowl, toss the Napa cabbage, carrots, cilantro and scallions together to combine and then cover with cold water. Let the vegetables crisp while you prepare the rest of the salad. 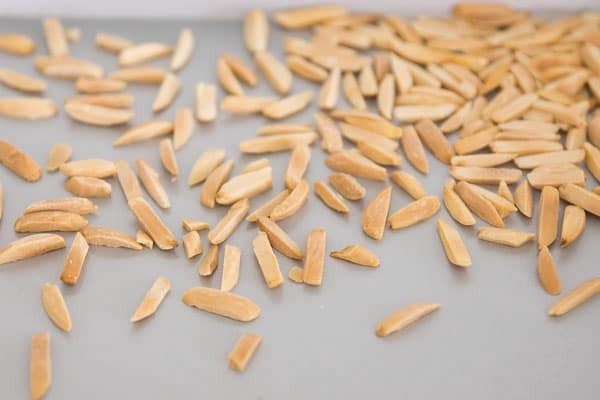 Place the almond slivers on a small baking sheet and toast at 350 degrees F (180 C) until golden brown. They'll go from just right to burnt in a matter of seconds, so keep a close watch on their progress. Transfer the almonds to a small bowl. Lay the wonton wrappers on a flat surface and use a pastry brush to generously brush one surface with olive oil. Use a sharp knife to slice them into 1/4-inch strips and give each strip a twirl before placing them on the baking sheet and baking until the wontons are golden brown and crunchy. In a medium pot with a lid, bring 8 cups of water and 2 tablespoons of salt to a rolling boil. Add the chicken tenders to the pot, cover with the lid and then turn off the heat. Poach until the chicken is no longer pink in the center (about 5-7 minutes, depending on how thick it is). 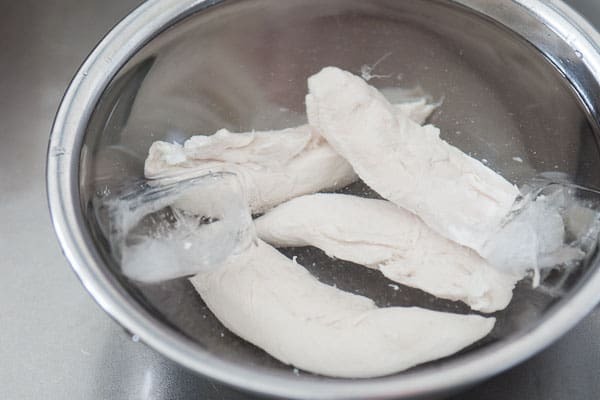 While the chicken is cooking, prepare a bowl of ice water. When the chicken is done, drain it and add the chicken to the ice water to stop the cooking. When the chicken is cool enough to handle, shred it and set it aside. In a small bowl, whisk together the orange juice, vegetable oil, rice vinegar, hoisin sauce, soy sauce, sesame oil, ginger juice, salt, mustard and white pepper until emulsified. Drain the salad greens and run them through a salad spinner, patting any remaining water off with paper towels. Add the greens to a dry bowl. Toss the salad with the sesame seeds and 2/3rds of the dressing and then place it in a serving bowl or platter. Top with the almonds, chicken, baked wonton wrappers and pour the remaining dressing on top. The salad needs to be served as soon as it's dressed. i’ve always wanted to know what was in those dressings but didn’t want to go to the source (wolfgang’s dc restaurant) to retaste his and figure it out! much appreciated, will be making VERY soon! It’s been so hot here in Australia that all I want to eat are salads. This gorgeous chicken salad is not only calling me, I think I can hear it banging pots and spoons. It’s outstanding. The color looks so refreshing and vibrant! Happy New Year to you. So glad you did this, my husband loves this salad, thanks so much! Happy New Year! What great timing. I have everything I need almost to make this salad having just roasted a chicken last night. Salad is one of a kind. Perusing the ingredients I wondered what the heck the wonton wrappers were for but the ingenious idea of using them for the element of crunch is well, ingenious! Hello, my name is Chris, with Dawn Star Press. We recently published an eBook that seems like it would be a good topic for your blog, and I was wondering if you would be interested in a free copy in return for a mention or entry in your blog. If so, please respond [email protected] with what format you would prefer to receive it in. The book is KNOW ENOUGH: Ethnic Cuisines, a common man’s guide to food from around the world and the cultures that created them.